Location: Harris Musuem and Art Gallery. Preston, England. 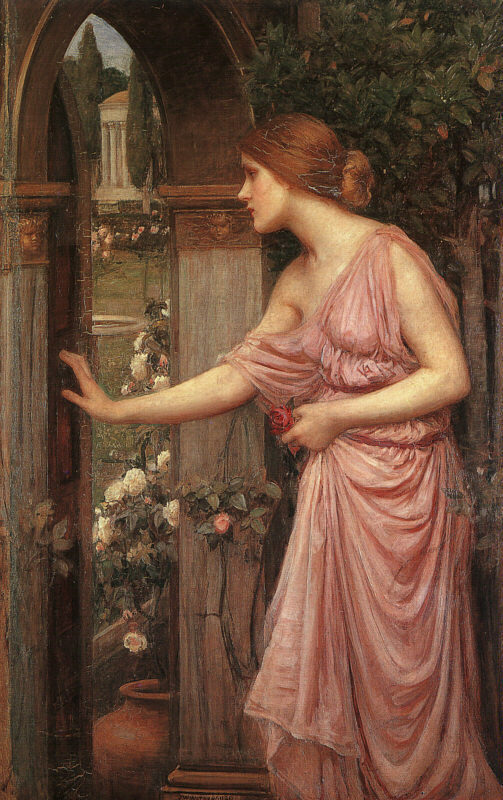 Psyche was a beautiful and desired princess who was taken by Zephyrus, the west wind, to Cupid's fantasy island full of golden palaces and lush gardens where she was to become his wife. She loved her new life but was told that she could never see her husbands face. When her jealous sisters came to visit her, they convinced Psyche to sneak into her husbands room while he was sleeping so she could look at him. She did and discovered Cupid, the god of love in all his splendor. While gazing at her husband a drop of hot wax from her candle fell on Cupid's shoulder and awakened him. He immidiatly flew away. Devastated, believing he would never return Psyche turned to Cupid's mother, Aphrodite to help her. 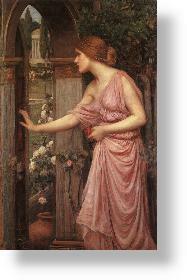 Jealous of Psyche's beauty, Aphrodite made her perform impossible tasks. Psyche was eventually reunited with Cupid. They were formally married and Psyche was made immortal. Unable to refuse another immortal as a wife for her son, Psyche gained the acceptance of Aphrodite. Her name means "the soul."